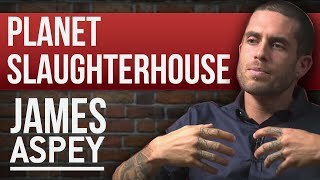 James Aspey is a animal rights activist from Sydney, Australia. At the age of only 17 he was diagnosed with leukaemia and told he had 6 weeks to live. He beat cancer after 3 years of chemotherapy and during that time he began partying and abusing drugs. He turned his life around once again and became a passionate personal trainer so he could help others with their health. He spent 7 years working on a cruise ship, and partying a lot was the norm. That lead to an eating disorder. His journey changed direction when he met a wise Indian man who told him eating animals is bad karma. He went vegetarian for a 7 day experiment and felt surprisingly great. He researched into the health benefits and realised how much he has been missing out! Upon more research he discovered the shocking and violent truth of what is being done to animals for food, clothing, entertainment and medical testing. It led him to the question, "If we don't need to kill and eat animals to be healthy, what are we doing this for?" The best justifications he could find or hear were incredibly weak. In 2014 he took a 365 day vow of silence and cycled 5000 kilometers to raise awareness for animals and promote peace over violence. He broke his vow during a live interview on Australia's most popular morning TV show. James is now travelling the world giving free speeches to make our planet a more sustainable place.